When you’re looking to get the best possible return on maximum payloads, the FUSO Fighter series is an obvious way to go.Hardworking and reliable, and fitted with durable, high-quality parts and a robust chassis, our FUSO Fighter trucks make ideal moving vans, tippers or roll-back auto recovery vehicles, and are suited to a host of other applications. 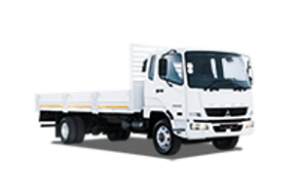 FUSO Fighter trucks are powered by highly efficient diesel engines, and offer one of the roomiest, most comfortable and contemporary cabs in the business. Its short-throw gearshift lever and down-sized steering wheel for improved grip and handling make the FUSO Fighter a pleasure to drive. Step-to-floor distance is optimised for easier access to the cab, and the instrument cluster provides easy, at-a-glance access to all the key driver info. The cab’s styling, fully adjustable driver’s seat, ample storage space and high-performance ventilation system create a comfortable environment to help reduce driver fatigue. The transmission is designed for smoother operation, improving turnaround times and reducing driver fatigue for safer trips. FUSO Fighter trucks are fitted with a class-leading chassis design that boosts durability and strength against torsional stress, even under the most rigorous conditions. The chassis is tough, lightweight and flexible, so it’s suitable for a wide range of body applications. The chassis frame’s rivet-free upper surface simplifies and lowers the cost of body mounting. Improvements to the FUSO Fighter’s diesel engine have improved performance and efficiency. The upgraded transmission is smoother shifting, with a high-rigidity, single-unit aluminium case and wider, more durable rear teeth. Servicing the FUSO Fighter is kept simple. Maintenance checks are performed by simply lifting the front panel of the cab, and modified hinges require less effort to tilt the cab for easy access to the engine. Heavy-duty brakes, fitted with environmentally friendly non-asbestos brake linings, are standard on all FUSO Fighter trucks. If you require any assistance in arranging finance or insurance please feel free to apply online and one of our qualified staff will be in touch to assist you further.